Scientists keep discovering important traits in animals that were once considered exclusively human. So when you hear references to bird brains, think about how our behavioral connection to parrots offers insights into addressing large scale social and environmental issues. A New York Times story by Natalie Angier reports researchers who study parrots report these birds rival great apes and dolphins in intellect and resourcefulness, and may be the only creatures, other than humans, capable of dancing to a beat. Parrots belong to the avian order Psittaciformes, which has 360 species including parakeets, macaws and cockatoos. Dr. Irene Pepperberg, the Harvard animal cognition scientist and parrot enthusiast, calls the birds “feathered primates.” Her grey parrot Alex can identify 50 objects in English and numbers one through six, and has grasped concepts that include bigger and smaller, same and different, color, and the absence of information. Pepperberg and others say they have capacities similar to very young children. According to Angier’s story, parrots are spontaneously inventive tool makers that produce food-fetching devices as needed. They have evolved extraordinary nutritional capacities and different populations of parrot communicate with each other using distinct dialects that remain table over time, like human languages. They ravage fruit trees, devouring seeds, and extracting plant embryos and the nutrients designed to help the embryos develop. They have even evolved ways to detoxify the chemicals plants evolved to protect themselves against predators that want to eat them. 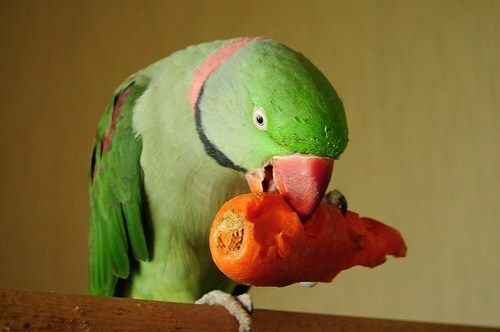 Scientists at the University of California, Davis, discovered that after eating toxic seeds, parrots consume bits of clay from the ground, thereby ingesting chemicals that bind with the poison to flush it out of their bodies. The clay also stimulates a mucous shield in their guts. Scientists think parrots’ food choices may have influenced their evolution as socially adept communicators. Fruit trees are an unpredictable resource, so hunting in groups, and being able to convey and receive information on the best finds was more promising than solitary searching. Angier quotes Leo Joseph, a parrot expert and director of the National Wildlife Collection in Canberra, Australia: group hunting meant “the development of a social system, as well as the neurological capacity to share information.” Parrots call to each continuously, over long and short distances. Scientists have also found that when groups of parrots move to new communities, the youngest parrots, like children, learn new parrot dialect much faster than adult parrots. Of course other creatures share traits it with humans, and not all are healthy. While storks that traditionally migrated between Europe and Africa are traveling less and are now more likely to stay year-round in Spain and Portugal. Scientists say the storks are becoming addicted to the ever present supply “junk food” they get in garbage dumps and landfills below their traditional flight paths. They are giving up their usual diet of frogs, beetles and insects, and scientists are studying other changes that may be taking place in stork communities. Scarcity, as well as plenty, changes bird habits. Sustenance is so hard to come by in North Korea that the region’s vultures no longer bother to stop on their annual migrations in search of a meal. Scientists from South Korea’s Ecology Environment Institute have been monitoring Eurasian black vultures winter migratory routes for five years, the JoongAng Daily reported, and have learned that the vultures stock up in north-east China before attempting the transit of North Korea to the relatively plentiful feeding grounds in the southern reaches of the peninsula. “This seems to happen because in North Korea the vultures can barely find animal corpses, which are major food resources for them”, Lee Han-su, the head of the institute, said. The food crisis for wildlife in the North mirrors that of citizens of the reclusive state, with the World Food Program reporting that 82 percent of human households do not have acceptable consumption during the lean season. How we make sense of the food world today and how it fits into our individual and community lifestyles is informed by understanding the behavioral patterns in all diverse biological ecosystems. Parrots may now also offer insight into the potential of using behavior based “coins” built on block-chain technology. 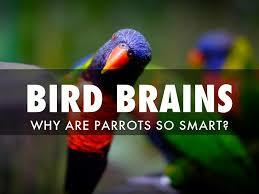 Consider a recent New York Times article, Parrots Think They’re So Smart. Now They’re Bartering Tokens for Food by James Gorman. The question of shifting patterns of behavior is a core concept of complexity thinking in human systems. Recent discussions in Plexus’s The Commons project group focused on developing a protocol for behavioral rewards that allow for individual privacy while providing system-wide information and data exchanges for research and program initiatives.